For some time now, Valeant Pharmaceuticals has been struggling. However, at this point, the company is on a clear path to recovery. So, it’s no surprise that we’re starting to see takeover bids. Recently, a biotechnology company out of Japan, Takeda Pharmaceutical, and a private-equity firm known as TPG, made an offer to takeover the company. If the takeover were successful, Takeda would focus on Salix Pharmaceuticals while TPG would handle the rest. 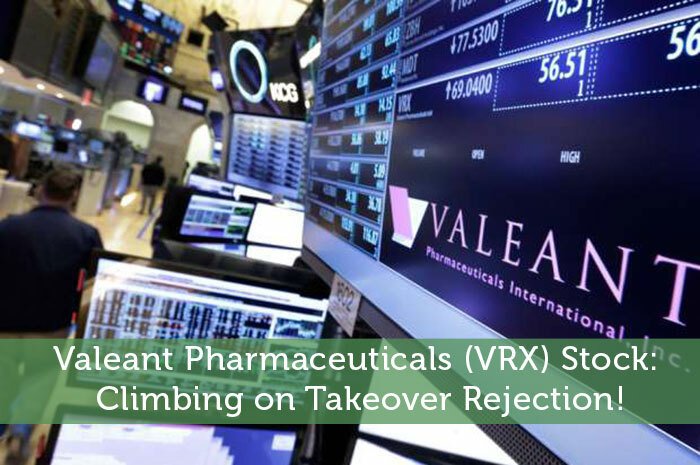 However, VRX made the decision to reject the offer. As investors, we know that the news moves the market. Any time there is positive news associated with a publicly traded company, we can expect to see gains in that company’s stock as a result. Adversely, negative news will generally cause declines. In this particular case, the news was overwhelmingly positive. First and foremost, investors tend to get excited when takeover bids are offered. However, in this particular case, the news that the company declined the bid is even more positive. The reality is that VRX has fallen dramatically, and many investors believed that declines would continue. If the management of the company felt the same, they would have sold out quickly. However, Valeant isn’t ready for that, they see more gains coming. As a result, we’re seeing strong movement in the value of the stock today. Currently (10:40), VRX is trading at $28.93 per share after a gain of $1.99 per share or 7.39% thus far today. Over the past month or so, I have been very forthcoming about my bullish opinion on VRX. The reality is that the company fell on an incredibly hard time. It had to deal with a scandal going public, which caused the loss of its biggest customer. However, in the months following the scandal, we’ve seen incredible positivity. The company has switched out it’s CEO, added members to its Board of Directors, and even signed a contract with Walgreens for the sale of its treatments. While I know that it’s going to take quite a while for investors to become confident in the stock once again, it’s clear to me at this point that VRX is incredibly undervalued. The reality is that the company has made it over the hurdle and is now once again moving forward. As a result, I’m expecting to see gains in the value of the stock moving forward. It is so obvious that VRX has bottom out and more positive developments will skyrocket the share price and company valuation.